The Jo LT Table Lamp by Vistosi has been designed by Pio And Tito Toso. The Jo LT Table Lamp is a light which is consisting of two oval components of blown glass that can diffuse and reflect the light. 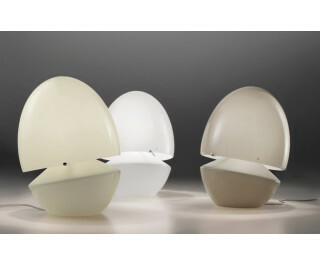 The fixture is available in three colors, white and grey and sand, having all metal parts in chrome. This beautiful light has been handmade on the Venetian island of Murano.